First came the print revolution. Now we are in the 3D print revolution. The possibilities are endless. If you can design it, a 3D printer can print it. From body organs to jet fighter parts to a kindergarten project, 3D printing is used today in a wide variety of ways with unlimited possibilities. As the cost of 3D printing goes down, each person has an opportunity to experiment with personally manufacturing a single item. Camden Public Library’s mission – Read. Connect. Discover. – is to bring access and knowledge to the community, whether through our print collections, or new technologies as they become available: computers, printers, scanners, telescopes, iPads, e-books. Now we are proud to offer a 3D printer, the current new technology which is in wide use in many industries throughout the world. We currently have one LulzBot Mini 3D Printer on display in the Rotunda when not in use. The LulzBot brand is made in the USA and has been around for several years. This model prints objects up to 6″x6″x6.2″. We currently offer 3-4 colors to choose from. The filament we offer is plant-based, recyclable PLA plastic (#7). PLA does not contain BPA and no safety concerns have been raised about using it with food. PLA is not heat resistant. 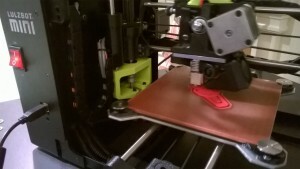 Anyone with a valid Camden Public Library card is welcome to use the 3D printing service. However, only trained library staff will handle the 3D printer and associated equipment and it may not always print on display. If you would like to watch it in action, you can take your chances and drop by, or make plans in advance by getting in touch with the 3D Printing Coordinator. Please note, we are not able to ship. 3D printed jobs are for local pick-up only and must be picked up within 14 days of production. Can someone help me with design? A few times throughout the year we host a “How to create a design for 3D printing”. Outside of that, we are not able to offer help with designs. Please double check your file before submitting it as we cannot perform any modification to your design. You can download Cura (from the Lulzbot website) and input “LulzBot Mini” as the printer and “Village Plastics PLA” as the filament. This will let you know how much filament your order will require as well as whether the finish size is exactly what you need. Cura works in millimeters, so please size your design accordingly. Printing cost is $0.15 per gram of filament. Total cost is based on the estimate given by the printing software program after you submit your design. Printing fees are collected at the Circulation Desk at time of pickup. Most 3D print items cost $5 or less, based on the maximum print area of 6″x6″x6.2″. When you submit a 3D Print Request form, we ask you to select an option regarding cost. For example, a bookmark may be printed with approximately 4 grams of filament, costing $0.60 (sixty cents). Printing times vary based on size, complexity, and any backlog. We aim to have each job completed within 1-2 weeks of submission. Please indicate on the 3D Print Request form if you would like us to notify you if the print job will take longer than 2 weeks. Do you have a group that would like to learn about 3D printing? Please contact the 3D Printing Coordinator directly. We may be able to arrange for a group presentation at your location.